James Bond goes to Japan, and You Only Live Twice self-hypnotizes itself with excessive eastern enchantment but awakens in time to deliver a film-saving climax in the heart of a dormant volcano. The space race between the USSR and the United States is at its peak. When a mysterious rocket ship literally swallows up an American space capsule, the enraged Americans accuse the USSR of space piracy. But the British intelligence services notice that the predatory rocket was launched from an island in the Sea of Japan, and agent James Bond is sent to investigate, after faking his own death to confuse his enemies. Bond's snooping leads him to Tokyo, where he is assisted by Tanaka (Tetsuro Tamba), the head of the Japanese secret service, and Aki (Akiko Wakabayashi), one of Tanaka's best agents. The criminal trail leads to the foreboding headquarters of Osato Chemicals, which Bond uncovers to be a front for the evil Special Executive for Counter-intelligence, Terrorism, Revenge, and Extortion organization. SPECTRE has been hired to trigger a nuclear war between the USSR and the US, to benefit an unnamed third country (assumed to be China). To hurry the plans along, the SPECTRE rocket ship next swallows up a USSR space capsule, further fracturing relations between the superpowers. While Bond is immersed into Japanese culture, complete with a mock wedding to local girl Kissy Suzuki (Mie Hama), the location of the SPECTRE headquarters in the heart of a dormant volcano is finally uncovered. Bond leads a mission to destroy it and prevent yet another act of space piracy which would catapult the world into a war of nuclear destruction. You Only Live Twice has a straightforward story, preying on the era's obsession with the Cold War spilling into a space race and the threat of creeping militarization in the skies. Relevant as the adventure is, it suffers from long gaps between meaningful events taking place, and the sedentary script descends into travelogue territory. The second half of the film, with Bond supposedly in training to immerse himself in Japanese culture, slows down and then comes to a full stop. The Roald Dahl script is far too mesmerized by a foreign culture, and mistakes respect for standing and staring. Too much of You Only Live Twice is a slow moving documentary, complete with a sleep-inducing Japanese-variation on the Bond theme. The final insult is that all of Bond's so-called training is for naught -- he never puts any of it into practical use. Most of the rest of You Only Live Twist is merely adequate. Sean Connery delivers an engaging performance, but he is beginning to show his age and the unmistakeable shadow of role fatigue. Donald Pleasence is terrific as the villain Blofeld, but he appears much too late, the script leaving a hollow space where the bad guy should reside for the most of the duration of the film. And the gadgets are cute but quite rickety. Little Nelly, the highlight gizmo in the movie, is a small do-it-yourself helicopter than Bond uses to take on a squadron of less-than-convincing enemy choppers. As for the ladies, they are most unmemorable. Mie Hama as Kissy Suzuki clambers over many rocks but does not speak much English, while Akiko Wakabayashi as Aki is only slightly more effective. 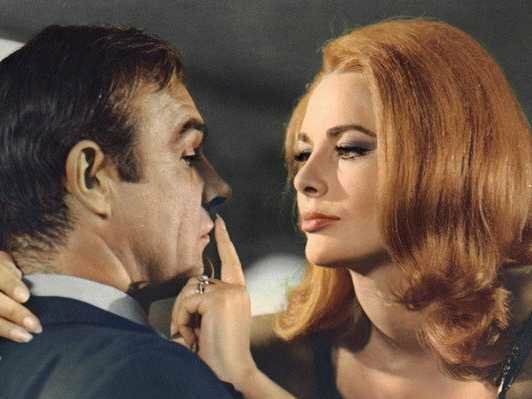 Karin Dor's Helga Brandt does little to distinguish herself from the token evil woman role. Ironically, Nancy Sinartra singing the transcendent title song is the most memorable female performance. It is left to the climax to give the film a jolt and lift it out of its slumber. 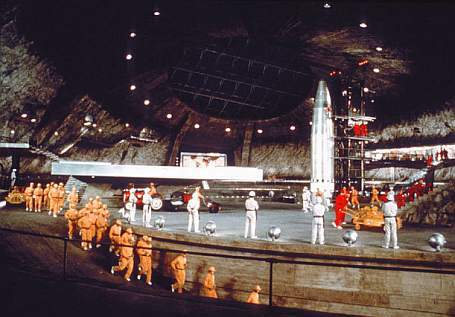 The massive volcano which serves as SPECTRE's headquarters for space operations is a remarkable achievement, and although the shiny technology on display creaks a bit at the edges, the intimidating set complete with retractable roof and hidden rocket launcher is by far the best thing going in You Only Live Twice. This is the earliest Bond movie with a full-fledged storm-the-fortified-evil-fort finale, directed with bullets flying and ballsy bravado by Lewis Gilbert, a crowning achievement that would be often repeated in the series itself and in countless other imitators. The rest of the special effects are only acceptable by 1967 standards, the space scenes of rocket-eating-rocket teetering between spookily impressive and outright laughable. You Only Live Twice proved to be the end of Connery's initial phase as Bond, a role he would nevertheless return to on two separate occasions in the future. As it turned out, Connery could live as Bond as many times as he wanted.